Ultra Wideband Antennas: Design, Methodologies, and Performance provides a valuable reference for the scientific community, as UWB antennas have a variety of applications in body area networks, radar, imaging, spectrum monitoring, electronic warfare, wireless sensor networks, and more. Giselle M. Galvan-Tejada received her B.Sc in communications and electronics engineering from the National Polytechnic Institute (IPN), Mexico City, Mexico; her M.Sc in electrical engineering from the Center for Research and Advanced Studies of the National Polytechnic Institute (CINVESTAV-IPN); and her Ph.D in electronics and telecommunications engineering from the University of Bradford, UK. Currently, she is working in the Communications Section of the Department of Electrical Engineering of the CINVESTAV-IPN as a lecturer and full-time researcher. She is a member of the IEEE and the National Council of Researchers of Mexico. Her research interests include radiocommunication systems, wireless sensor networks, radio propagation, antenna array technology, ultra wideband antennas, WiMAX, space division multiple access, and techniques to make efficient use of the spectrum. Marco Antonio Peyrot-Solis received his B.Sc in naval sciences engineering from the Mexican Naval Academy, Antón Lizardo, Veracruz; his M.Sc in electrical engineering from the United States Naval Postgraduate School, Monterey, California; and his Ph.D in electrical engineering from the Center for Research and Advanced Studies of the National Polytechnic Institute (CINVESTAV-IPN), Mexico City, Mexico. Currently, he is working for the Mexican Navy Research Institute (INIDETAM), Veracruz, Mexico, and his research interests include ultra wideband antennas and electromagnetic compatibility. Hildeberto Jardon-Aguilar received his B.Sc in electrical engineering from the School of Mechanical and Electrical Engineering of the National Polytechnic Institute (ESIME-IPN), Mexico City, Mexico, and his Ph.D in radio systems from the Moscow Technical University of Communications and Informatics, Russia. He is currently a full professor at the Center for Research and Advanced Studies of the National Polytechnic Institute (CINVESTAV-IPN), Mexico City, Mexico. His research interests include analysis of nonlinearities in radio-frequency and microwave circuits, electromagnetic compatibility, antennas, and photonic systems. He is the author of five books and more than 100 technical papers published in journals and symposiums. "The topic of ultra wideband antennas continues to be of vital interest to the commercial and defense communities. The ever-increasing demand for wider bandwidths, while retaining compact size, will assure that books on this topic will continue to proliferate. I highly recommend that Ultra Wideband Antennas: Design, Methodologies, and Performance be a critical adjunct to every antenna designer's library." "This is an outstanding reference with practical design formulas for a wide variety of useful ultra wideband (UWB) elements. This guidance helps an antenna engineer implement a near-optimal design quickly, minimizing the time required to tweak or adjust the design. This work should be on the shelf of anyone interested in rapid implementation of UWB and broadband antenna designs." 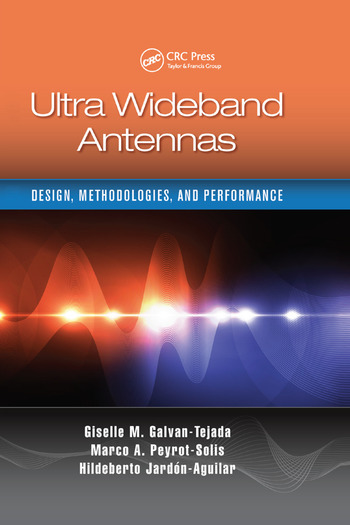 "... provides a comprehensive treatment of the theory and design of UWB antennas." "... perfect for entry-level UWB antenna designers as well as UWB equipment designers and operators."